Part of a short-lived wave of gospel choirs signed to Motown in 1962/3, the Burnadettes were a female gospel group led by musical director Joseph Norris, about whom almost nothing is known. 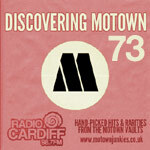 They had just the one single released by Motown before the label pulled out of the gospel market, but they had recorded much more material which remained in the vaults until 2012. Sadly, on the evidence of the excellent previously-unreleased Burnadettes material contained on the Unreleased Motown 1962: Gospel collection, the two tracks actually chosen by Motown for release on a 45 are by some distance their worst two cuts.